Cool grungy distressed graphic t-shirt brings out the Captain Awesome in you! 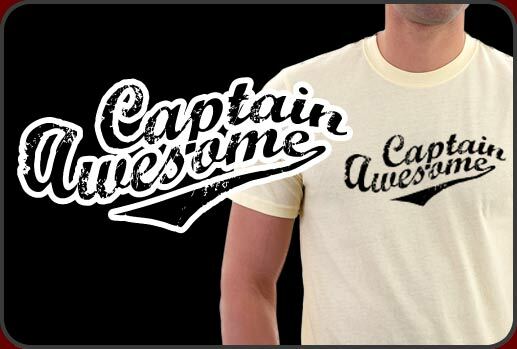 There is no penalty for overusing the word awesome as much as possible and this Captain Awesome shirt will let you say it with pride. Pull one on before you head out to work or play and feel the awesome power of awesomeness fill your soul because yeah, man, now you are...Captain Awesome! Funny shirt design in cool grungy distressed lettering has tons of appeal and hilarious attitude. Our Captain Awesome shirt prints great on any color or style you choose.